A Medal of Honor and a Holy… euchre deck? November 1864 – 150 years ago this month – saw a curious spectacle in the American Civil War. After Union General William Sherman captured the city of Atlanta from Confederate General John Bell Hood, both armies turned and headed away from each other, with the goal of bringing the hard hand of war to their opponent’s civilian infrastructure. 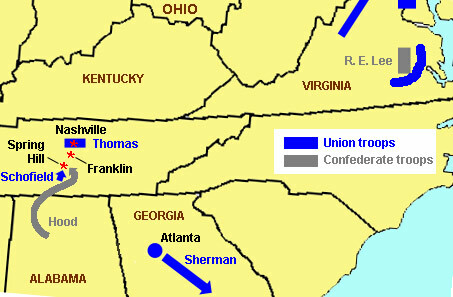 Sherman headed southeast on his infamous March to the Sea, intending to “make Georgia howl”. Hood turned north on what could have been just as infamous a march, perhaps even inducing some howling north of the Ohio River. But where Sherman’s march was a success, Hood’s march failed to even make it out of Tennessee. An Oberlin man would earn the Medal of Honor and an interesting keepsake for the part he played in stopping him. Hood now knew that his northward journey would be a difficult one, but being one of the most aggressive commanders in the war, he was not deterred. His army was larger than either Thomas’ or Schofield’s detachments, and he believed that if he could isolate them and bring them to battle independently, he could destroy them in kind, then turn his attention to Ohio’s “bread basket”, or perhaps come to the rescue of Robert E. Lee’s besieged army in Virginia (see my Battle of New Market Heights blog). 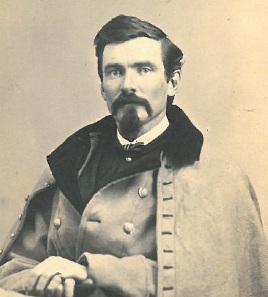 Hood’s first victim was to be General Schofield, who had a vulnerable supply line leading back to the main Union depot at Nashville. Hood devised a plan whereby he would march his army around Schofield’s flank to Spring Hill, Tennessee, where he could cut that supply line and isolate Schofield from Thomas before they had a chance to link up. The movement was accomplished brilliantly, but when Hood’s troops arrived at Spring Hill on November 29, they were met by a division of General Stanley’s 4th Corps, which had been sent in advance with Schofield’s wagon train. It’s not known what part Major Steele played in the fierce fighting that accompanied this part of the battle, but his comrades held their ground, and the rebels retired at nightfall. 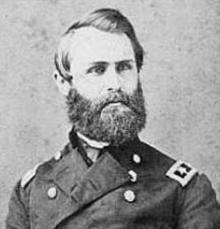 Steele recovered and returned to action, this time in Texas, to fight the last major Confederate hold-out, General Edmund Kirby Smith. He received one more promotion, to brevet Lieutenant Colonel, before he was mustered out of service in 1866. We are coming to understand now what was not so clear in the days of his young manhood, that we cannot require the same kind of response from widely different temperaments. 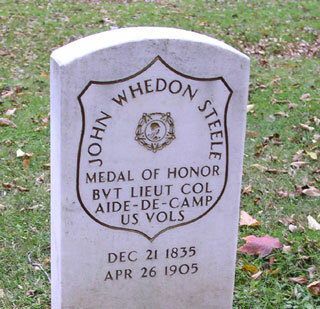 John Whedon Steele is buried in Westwood Cemetery, Section R, where his grave is a stop on the Oberlin Heritage Center’s “Radicals and Reformers” history walk. “Pension applications for service in the US Army between 1861 and 1900”, National Archives. Posted in Oberlin and the Civil War | Comments Off on A Medal of Honor and a Holy… euchre deck?